Meet the team behind our fabulous Menchie's Mixes! About Me: Having grown up all over the world and tasting delicious foods from around the globe, I contribute a unique and creative perspective to the product development process. After working in the food manufacturing industry for over 2 years, I decided to train as a sous chef and make the shift into research and development. My favorite activities, outside of creating delicious frozen yogurt flavours, are swimming and hiking. My favorite Menchie's Mix: Pure Chocolate topped with Reese's peanut butter cups and Reese's pourable peanut butter! About Me: I have always loved milk and all the wonderful foods that are made out of it, especially yogurt! I worked for five years in the food industry, growing and producing the wonderful, helpful bacteria that are necessary to make yogurt the great food that it is. At Menchie's, I have the opportunity to take my love for yogurt and develop fun, tasty flavours to share with the whole Menchie's family! My favorite Menchie's Mix: Fresh shredded coconut topped with white chocolate and mochi! About Me: For as long as I can remember, I have always loved desserts. I was on the path to becoming a pastry chef until I discovered my affinity for Chemistry. I stumbled upon Food Science, which was the perfect subject for me to major in. In 2010, I began working in the food industry. I have worked with a handful of different products, like caramel dips, sour cream and bread, but have found I love to create flavours in frozen treats the most. When I’m not helping create flavours to make the Menchie’s family smile, you can find me playing volleyball or reading on the beach. My favorite Menchie's Mix: Irish Mint swirled with ICSB topped with chocolate chip cookie dough and hot fudge. 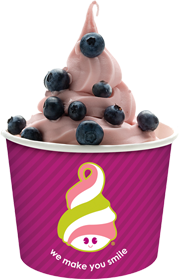 Want to suggest your own Menchie's flavour?